These days, most people have had some experience with video chat through work-related video conferencing or consumer applications like Skype and Facetime. But a different level of care and professionalism is necessary to deliver a quality experience for patients. It is essential to earn the trust of patients and convey the same level of empathy that you would expect from an in-office visit. Over time, these habits will become second nature, but if you are new to delivering care via video, keep these best practices for creating a professional telemedicine experience in mind. We’ve put this first for a reason. First and foremost, it is important to have a solution that offers adequate privacy and security for your patients. It should be a platform built for this purpose and it must be HIPPA compliant. Next, it must be a high-performance platform so that you can clearly see your patient and they can see you. The voice quality must also be crystal clear. The software should be easy to use for you, your staff, and your patients. In addition to the telemedicine software, also consider the quality of your webcam and the speed of your internet connection. These days, most business internet systems are more than adequate for telemedicine, but it is something to test. Eye contact is just as important during a remote visit as it is when the patient is sitting right in front of you. Proper placement of the webcam ensures that you can create the necessary emotional connection when discussing the patient’s concerns and treatment plan. If you are unsure how the camera should be positioned, practice with a member of your staff so that you can get the placement just right. It is also a good idea at the start of the visit to ask the patient if they can see you clearly. Also, note that you want to look directly into the webcam when you are speaking. Not at the patient’s face on the screen. We often say that one of the advantages of remote visits for providers is that they can be done from anywhere. By this, we mean you don’t have to be at the office necessarily, but we don’t mean literally anywhere. You need a space that is free of background noise, one that provides adequate privacy, and one that reflects the professionalism you want to be associated with your practice. It is always a good idea to test what the background will look like for patients. You can certainly do remote visits from home or a hotel room, but make sure the background that the patient will see is tidy. It is best to use a desk or task table so that you are sitting up straight as you conduct the visit. Plus, a quiet, clean space will look much more professional on video. Before a visit, check what’s in the patient’s field of vision. If you’re doing the visit from home, tidy up and make sure there’s no clutter in the background. One of the biggest benefits of video visits for patients is that they eliminate the time wasted in waiting rooms. You don’t want to make them wait for the video visit. If a delay can’t be avoided, make sure there is a notification system in place to let patients know when you will be ready for the visit. This probably goes without saying, but you want to look as authoritative and professional over the web as you do in person. Everything you can do to replicate the level of professionalism that a patient would experience in the office is important to the success of your telemedicine program. Therefore, you should dress in the same way you would if you were seeing patients in the office. 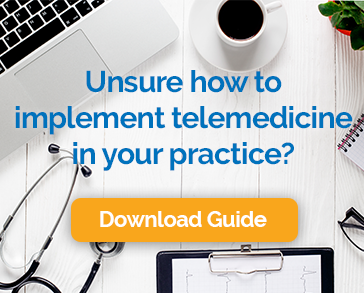 Using a telemedicine platform can reduce the amount of time it takes to see each patient, creating an opportunity to increase practice revenue. This is best achieved if you read the patient’s complaint and review the chart prior to the visit and are ready to get to the matter at hand. If you need to review a document or write something down, let the patient know what you are doing. It may be obvious to a patient who is in the same room, but online, this can look like you are disengaged or distracted. Even with the best telehealth platforms and quality internet connections, there can be some lag time during the conversation with your patient. Therefore, it is a good idea to leave a few seconds between their last words and when you begin speaking again. When you wrap-up the visit, make sure that you are very clear about any follow-up visits, prescriptions, or treatment instructions. Ideally, you’ll also make these instructions available in a patient portal so that there is no confusion about what should happen next. The most effective way to make sure you are delivering an excellent patient experience is to ask the patient. Let them know that you are open to feedback and that you want to make sure they are satisfied with their video visit and that they feel that they have received the same quality of care that they would have had the visit been in-person. Replicating the in-office experience over video isn’t difficult, but it does require some attention to detail. If you keep these things in mind, you’ll delight your patients, make your practice more efficient, and give yourself more flexibility in your schedule.